The New York Times became an investor in Tina Brown’s event series Women in The World late last year. When the news was announced, the Times promised a new website for the brand. 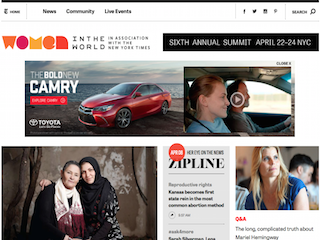 Today that site makes its debut, at nytimes.com/womenintheworld. The new site features responsive design and is updated throughout the day with content from Women in The World’s editors and producers. The event series even has a snazzy new logo. The next Women in The World conference is April 22 to April 24 at the David H. Koch Theater. The summit will feature a keynote address from Hillary Clinton.